Well, let’s break it down based on the specs and price and take a look in this review! By the end, you’ll know for sure if the GXiVR8080A2 is the PC for you, or not. Have a question? Feel free to leave a comment! I read them all and reply to most of them! CYBERPOWERPC has done the impossible with this i7 8700K/GTX 1080 Ti powered gaming desktop, peroid. It would be impossible to build this yourself for the same cost without doing some serious shopping around and waiting for weeks on end for the perfect sales. What are you waiting for? BUY IT! Connectivity: 6x USB 3.0 | 2x USB 2.0. 7.1 channel audio. Integrated ethernet + WiFi. This $2000 gaming desktop is a complete and utter beast for the price. CYBERPOWERPC has seemingly done the impossible and delivered this insane GTX 1080 Ti and i7 8700K powered behemoth for a price that you could not beat yourself – not without waiting around for weeks on end for the perfect sales to crop up. That’s not even taking into consideration the GPU shortage that’s been plaguing gamers since late 2017! Even in a perfect market, you would be seriously hard-pressed to source the parts for this build and get it up and running for less than $2000. Chances are, you could find all of the parts for around $2000 but then you’d be putting out another $150-$200+ for a copy of Windows 10, a keyboard, and a mouse. 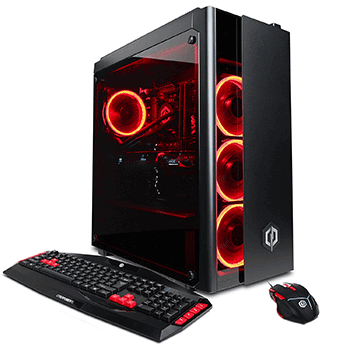 So, what you would have to spend $2200+ to get, CYBERPOWERPC can give you for $1999. That’s damn decent if you were to ask me! Let’s break the parts down and see what makes this beast tick. For reference value, I’m going to omit the case but I’ll mention that it’s fairly solid. Nothing shakes or shudders and it seems of good quality with lots of room for cable management and airflow, otherwise there’s not much else to say about it. Processor (CPU): The CPU in this build is a brand new i7 8700K – the current king of gaming and practically everything else. It’s a 6 core 12 thread processor that runs at a default speed of 3.7GHz-4.7GHz depending on what you’re doing. I mean it when I say this is the current king of gaming too, it’s currently unmatched in terms of raw performance and won’t be until Intel releases their next flagship i7 processor. The cooler used is an Asetek 550LC liquid CPU cooler. Asetek might not be a brand you’re familiar with, but they’re actually one of (if not the) biggest OEM supplier of AIO liquid CPU coolers to companies like Corsair, NZXT, and a whole bunch of others. If you wanted to compare the Asetek 550LC to a “branded” cooler, check out the Corsair H60 because they’re effectively the same thing. Motherboard: The mobo used in this desktop isn’t amazing but it’s most definitely not bad either. You’re getting an ASRock Z370A Pro4 which is very much a good board with solid features – it’s just not super high-end. It’s packing 4 USB ports, integrated audio, and enough room to add more RAM if you wanted to. Graphics (GPU): The biggest draw of this build is the graphics card used which is a GTX 1080 Ti. You’ll be getting an MSI GTX 1080 Ti Aero which is in the lower-end of the GTX 1080 Ti spectrum as it’s a reference-based design, but it’s still a great card that’ll perform like you want it to. However, there’s also a chance that you might get a completely different brand of GTX 1080 Ti with your particular GXiVR8080A2. Some people have received EVGA GTX 1080 Ti SC which are all-around great cards. 4K gaming isn’t an an issue for a GTX 1080 Ti and you can even use it for high FPS 1440p gaming if you wanted to. The 11GB of VRAM makes this card a complete and utter beast and as of right now there’s simply no competition for it – it is the best. Memory (RAM): The RAM used is very cheap and borderline generic, but some sacrifices have to be made! You’ll get 2x8GB sticks of ADATA’s most basic 2400MHz DDR4 RAM. It’s nothing fancy, but it’ll get the job done well enough. It’s worth noting that these are old-school looking ugly green (classic PCB-color) sticks of RAM without heat spreaders. Storage: Although it comes with lackluster RAM, this build makes up for it by packing awesome top-level storage drives. You’re getting a 1TB WD Blue HDD and a 240GB WD Blue SSD. Both are high-quality and are great to see used in a build of this level. Ideally, I would have liked to see a 2TB HDD used, but 1TB is good enough for most people. Storage can easily be expanded as you see fit up to another 4 drives, just make sure you buy SATA data cables! Power supply (PSU): Usually, the power supplies used in prebuilt desktops are sub-par at best. However, that’s not the case with the GXiVR8080A2. 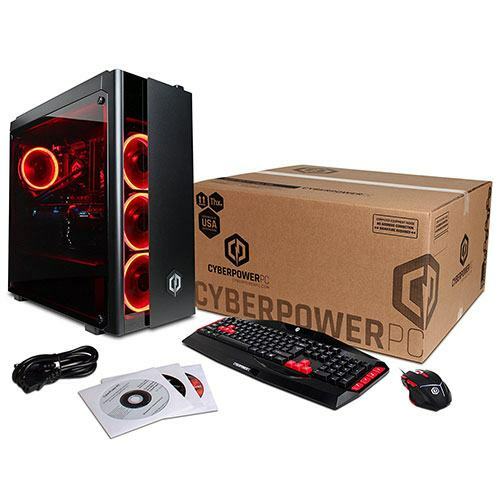 Instead of using some no-name brand generic supply, CYBERPOWERPC opted to throw in a 600W 80+ model from Thermaltake. It’s not a tier 1 supply by any means, but it’s still significantly better than the no-name generic supplies we’re used to seeing. Connectivity, OS, Etc: As far as connectivity goes, this build should have everything you need, assuming you don’t need anything crazy. It’s loaded with 6x USB 3.0 ports as well as 2x USB 2.0, that’s a total of 8 USB ports and it should be enough for basically anything you need including VR. It has integrated ethernet for a wired internet connection and it will also support WiFi just in case you can’t run a wired connection. This build comes with Windows 10 already setup and installed as well as all of the drivers you’re going to need. Meaning, you can plug it in as soon as you take it out of the box and start gaming instantly. CYBERPOWERPC also throws in a cheaper keyboard and mouse with the majority of their builds and the GXiVR8080A2 is no exception. You’re not getting anything exceptionally fancy here, but you are getting a reasonably solid mouse and keyboard that could definitely be used for more than just paperweights. A build that’s equipped with 16GB of RAM, an i7 8700K processor and a GTX 1080 Ti graphics card is going to readily deliver smooth, crisp 4K gaming without an issue. Since the GXiVR8080A2 comes with everything I just mentioned, you can assume without a doubt that it’s going to be a 4K gaming monster, and you would be absolutely 100% correct. Or, if you prefer super high frame rates on a 144-240Hz monitor, 1440p would be a piece of cake. Don’t take my word for it, check out this benchmark video so you can see for yourself. The rig used is very similar to the CYBERPOWERPC GXiVR8080A2 only is has slightly faster RAM. Now that’s some pretty awesome performance. With most games set to ultra settings, a GTX 1080 Ti and i7 8700K with 16GB of RAM has no problem maintaining 60fps+ in 4K across all but the most unoptimized of games. The only way to get better performance would be to add another GTX 1080 Ti, but even there there are no guarantees you’ll get better performance as SLI is supported on a game-by-game basis. It’s worth noting that since the RAM used in the benchmark video is a little faster, there’s going to be a very small performance difference between the video and the GXiVR8080A2. It won’t be huge, though, roughly a maximum of 5fps difference in most cases. To build this gaming desktop yourself, you’re looking at spending a fair bit more to get roughly same components, once the cost of your time is taken into consideration at least. Not that building your own PC is a bad thing (it’s awesome, trust me) but it’s something that has to be considered because not everyone wants to build their own desktop. If we break CYBERPOWERPC’s GXiVR8080A2 down to the component level we can get a good idea of how much it would cost to build the same rig ourselves, including a copy of Windows 10 and a cheap keyboard + mouse. This is all assuming that you could ever buy a GTX 1080 Ti for its MSRP of $699, which I’m sure we all know was never really possible. More often than not, the best price you could find one for would have been $750-$800 or thereabouts. With that taken into account, we can (blindly) assume that the actual cost of this build would be closer to $1900-$1950. Paying someone $50-$100 to assemble your PC for you and install all your OS, all of your drivers, and then test it for stability is a pretty good deal. 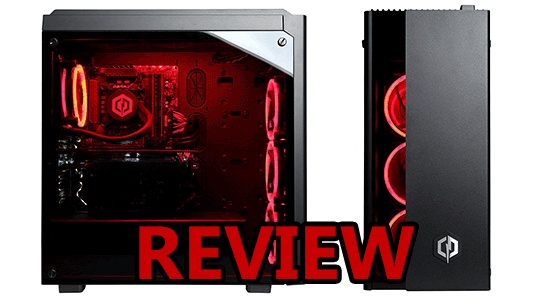 I hope by now this review has helped you see how solid CYBERPOWERPC’s Gamer Xtreme VR GXiVR8080A2 is when it comes to price vs performance and everything you’re getting. For basically the same cost you could buy the parts for, you’re able to get a 4K-ready gaming beast that’s not going to disappoint. If you’re reading this during the GPU shortage, this build is even MORE valuable because of the GTX 1080 Ti. As I’m writing this, the GTX 1080 Ti can not be bought for less than $1000 with the average price being closer to $1300 or more. Now, I don’t know about you, but I’d rather spend $2000 on something than $2200-$2500+ for the exact same thing because of a shortage in supply. All-in-all, this is an awesome priced build with a ton of value regardless of when you’re looking at it – assuming the GTX 1080 Ti isn’t obsolete yet. If you’re looking to get a kickass 4K gaming PC without having to put it together yourself, look no further than the CYBERPOWERPC Gamer Xtreme VR GXiVR8080A2. Battlefield 5 is going to be out soon. Can you tell a good setup to run it at max settings flawlessly. Apparently Ray tracing is a thing of the future. So cards that support that will be more helpful I guess for the next few years. Please advice on a setup. While you can’t directly buy an Asetek 550LC, you can buy derivatives of it from other companies. Asetek is an OEM supplier and companies generally buy their coolers in bulk to either use in desktop builds or rebrand & alter to call it their own. 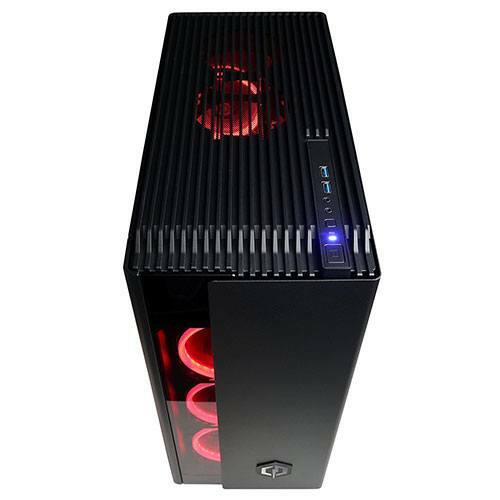 Corsair’s H55 would be a design that’s based on the Asetek 550LC if I’m not mistaken. Is it possible to change the rgb colors of the fans? I bought this because it was a nice deal at the time, but I ended up upgrading some parts in the end anyway. I wanted to add a larger radiator, 240mm or so, but it seems like I cannot fit any on the top vent as it intervenes with the RAM sticks. So I decided to go with a full 360mm radiator on the front; replaced the fans, etc. However, I am unsure of the case’s frontal air intake flow. Most of the airflow intake seems to enter through the bottom. It seems like it gets the job done but I was curious on your take in terms of airflow performance from the front of this case. 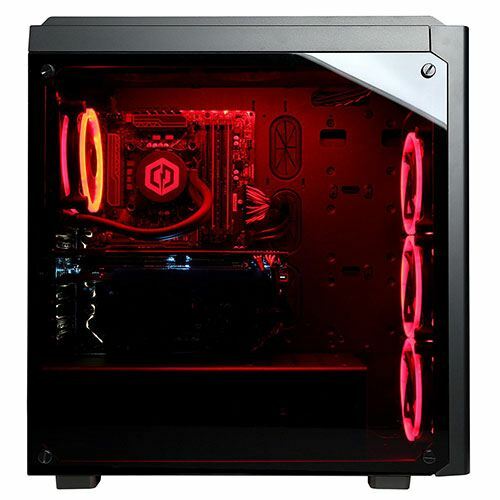 It doesn’t seem like a front mounted radiator is the ideal route for this specific case but it should not be much of a problem. Do you think the case is efficient for this type of setup? Thanks. Airflow is a bit of an issue on the front of this case, but it shouldn’t be enough to choke a 360mm radiator. Personally, I would aim for negative air pressure as it’ll help draw more air into your case. It might be a little dustier, but your parts should run cooler as a result. hi I bought this and I noticed that there was only a quick start guide and something about the motherboard but no like real manual about how to use it is there some website I can go to get a manual? I’m sorry to hear you’re having troubles. I don’t believe CyberPowerPC has any kind of usage manuals for their PCs. However, you do have access to their Tech Support (for life, for free) and I’m sure they would be happy to answer any questions you have (get in touch with them here). Alternatively, if you let me know what you’re having troubles with, I might be able to explain it or I might have already published some content that could help which I could link you to. Ok so I just got this thing and it is amazing but there two hdmi ports and it says to only use the Graphics cards one for monitors what can you do with the other one above the graphics card . The display connections from your motherboard (the ones above your GPU) cannot utilize your graphics card; instead, they’ll use the CPU’s iGPU (integrated graphics) which isn’t ideal for gaming as you can imagine. You could use it for a secondary monitor that you don’t use for gaming, or something along those lines.